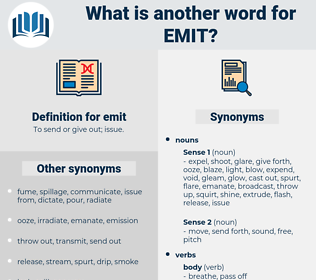 What is another word for emit? To send or give out; issue. praying to the porcelain god. Issued, Delivered, Provided, Entered, expressed, made, broadcasts. lay, produce, discharge, generate, initiate. deny, suppress, veto, hold, keep, be quiet, repress, take, refrain, permit, conceal, contain, refuse, hide, allow, take in, withhold. bring, carry, hand, convey, give, receive, get, inhale, soak, sponge, retain. There are flowers that emit but little fragrance until they are bruised. Shall he give it up mutilated, shall he mar it, shall he darken it, shall it emit no light, shall it be valued at no price, shall it excite no wonder? 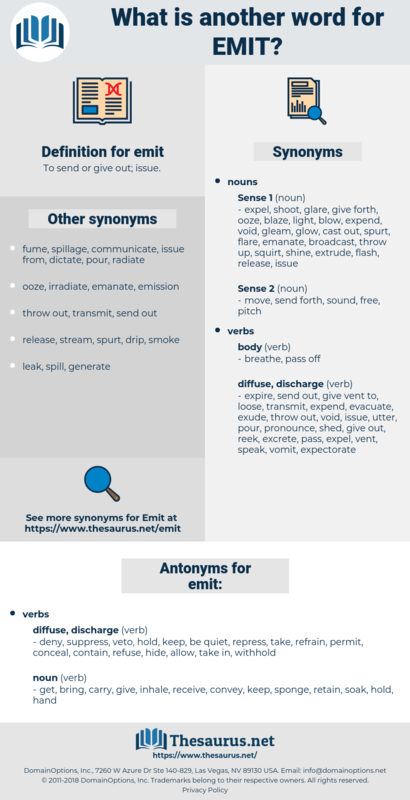 emmet, emote, endue, emended, enmity, emydidae, emmanthe, ennead, endowed, enid, endued with, ended, EMDA, emend, emanate, eminent, endow, end, enate. burp, belch, give forth, exhale, emanate, eruct, bubble, force out, radiate. eject, release, expel, discharge, exhaust.